This unique Lenox bowl dates to 1971 and is larger than the typical china serving bowl. It would be perfect for pasta, popcorn, salad greens, potato salad, or other kinds of food that are often served in large quantities. 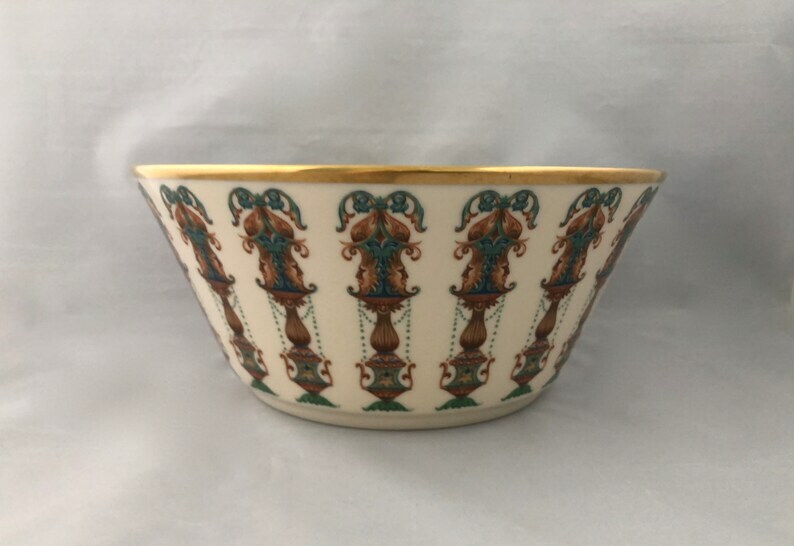 The design of the bowl has a more contemporary shape with a defined bottom and straight sides, but also features Lenox's traditional ivory bone china background. The side decorations on the bowl feature vertical images depicting identical classical columns that can be viewed from all sides. Each classical column is made up of a montage of images of beading, scroll work, foliage, and turned and reeded vertical columns. The coloring of the columns is mostly bronze with deep sea colored accents. Generous quantities of 24K gold banding have been applied to the top edge. The bowl measures approx. 10 1/2" across the top and 4 1/2" tall. The piece is in excellent like new condition, and even still has an original 24K gold sticker on the bottom. It would be a great accent serving piece for your use, or to give as a gift to another, or perhaps to a bride and groom.